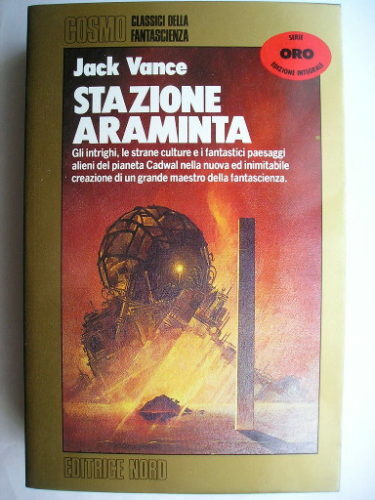 The novel “Araminta Station” by Jack Vance was published for the first time in 1987. It’s the first book of the Cadwal Chronicles. When Glawen Clattuc turns 16 his destiny is decided according to the strict rules ruling human presence on the planet Cadwal. His father manages to foil an attempt to sabotage the boy’s future by Spanchetta, a relative who hates them, and Glawen is given a place in the planet’s aristocracy and enters Bureau B, the police force of Araminta Station, the most important settlement on the planet. Glawen gets romantically connected to Sessily Veder but during a party the girl mysteriously disappears. The investigation leads to the suspicion of a tragic demise for the girl but there’s not enough evidence to convict the man suspected of the possible murder. It’s just one of the events wrapped in mysteries that have Glawen’s attention over the years.